I love the model. Look forward to seeing more awesome axes like this. would love to know where this drops. It's a heroic drop. Not sure which instance, but from the looks of the axe I'm guessing Uthgarde Keep. exactly the same speed, dps, and damage of Titansteel Destroyer. this one provides haste and agility, the other one gives more strength, stamina and hit rating. i think i'll go for this one while waiting to get raid weapons and arena gear. Very nice axe. For sure drops from Heroic Halls of Lightening. SS added. This is a prove of the fact that the Heroic<->Entry-Raids gap has been solved better then it has in TBC. This Item is Itemlevel 200, and exactly as strong as a 2h from Naxxramas (Claymore of Ancient Power for example), making the transition from fresh 80 to Raids way easier, it could even be possible for a Guild to skip 10 Man Naxx and go to 25 Man directly if they spend some time gearing up with Heroic Gear like this. Also, gearing up rerolls or alts in general and making them ready for raiding will be much easier thanks to the fact that Heroic Loot has Itemlevel 200 (same as 10 man naxx), this makes up for Honor Gear also requiring Arena Points now (In TBC Alts usually got equipped with at least a weapon from honor points to make raid entry easier, just because Heroic loots where worthless on 70). Love the fact that heroics drops things like this, at par with naxx 10 man gear. If your basic aim in WotLK is to not raid and just do some instances when you wish to, but you STILL have the skills needed to finish of a hard boss, this expansion finally provides you that opportunity. And by logic we all know it's easier to get 5 really good players then 10 really good players. only heroics are actually just as hard as naxx(10 or 25) which is easily puggable if u know what ur doing. What a monster! That axe would probably chop off both your legs if you dropped it by accident. One well-known knifemaker describes fantasy weapons aptly: "Something you can't make a sheath for..."
Does the skull on the axe reminds you of an undead with the spike hairstyle? Yo Dawg, I heard you liked axes, so I put an axe on yo axe so you can chop while you chop! Is the drop rate really only 4%, or is this because of lack of data? wowhead.com counts in every time this boss has been looted, and mixes up heroic and non-heroic. This is 4% of all heroic and non-heroic lootings of this boss, and since there are A LOT more non-heroic runs then heroic runs the calculated drop rate is really low. and the boss that drops this, Loken, has 4 epic items in his heroic-loottable. No, it isn't 25% its just a 1 in 4 chance that you will get it. Remember just because something drops 4 items doesn't mean that the precentages cant be something jacked up like 12%, 33%, 40%, 15%. Hopefully this axe is 25% or better because I want it on my pally and our tank wants it on his DK. While it is a fairly good and well balanced axe to start raiding with, it also has the benefit of being great for Death Knight tanking with 2 Handed weapons, due to the avoidance brought upon by the agility and strength. Not bad for a DK tank. What's the purpose of adding the pointy bones/tusks from the skull PAST the axe-blade? You can't chop anything. Only stab. Been farming for this for a week now, but it never drops. Not the best stats ever though, still 20 dps over almost anything one can get in heroics. I'm still getting this for my DK. You know that 1/4 = 25% ? It's a pain to get this coming from one of the most annoying boss in Wrath. The axe is worth it for all the attempts. The real upgrade is Death's Bite form Naxx so this axe will last you for a while. super annoying to get. killed the boss about every day since the last ding and still haven't seen it drop. oh well, at least its free emblems. i wonder why there's only one 2hander drop from heroics though. Feels like Sword of Justice is better with a good gem. "We put an axe on your axe so you can chop when you chop"
Omg i been doing this with seconds of it being reset for 2 weeks still only got 1 i need 1 more and you can say bye bye to me on the damage meter baby because fury with 2 of these will be so insane! While I would say from the other side (another 2h user in the group) that you are being selfish for taking a 2nd from those who have none, it would indeed be sweet with Titan's Grip. I would suggest due to curtasy to pass to others if you have 1 already and someone is looking to get their first (or only for ret pallies). Well then I'm sorry to inform most of you DK tanks out there, that in the next patch blizz will implement at least 2 new 2h-tank weaps. SO PLEASE, stop taking my axeaxeaxe(?) away from me and chill-out 'til next patch! Are you kidding me? Given the stats, this axe is amazing for 2h tanking with a DK. I've had ret pallies, warriors, and other DKs promise to pass on this for me should it ever drop (I've done heroic HoL three times now) because of how great it is. It's incredibly selfish for another 2h user to say we shouldn't be rolling on this axe. If you're in a heroic to begin with, any TG warrior should already have a very nice set of 2h's from either quests or another heroic. Any pally should also have a fairly nice weapon at this point. There are very few items of this caliber pre Naxx25. I honestly can't wait to get my hands on this as a frost DK. It's far easier to hold threat with a 2h over duals from what I've seen. Chalk one up to Blizzard for not completely leaving us out to dry. I just checked out WoWInsider for the new blacksmithing weapons, and hopefully they will be making these BoE and not BoP and I will most certainly take one of the two. As for your comment zito, I was merely agreeing with the sentiment that it's a bit selfish for anyone to be annoyed by a class that could make very good use of a weapon not to roll on it. I completely agree that this also an amazing weapon for a TG warrior as well.... especially after showing it to my brother and having to wipe drool off my keyboard. Sup dawg, I heard you like axes, so I put an axe on yo axe so you can chop while you chop. Edit for patch 3.1: With the changes to Seal of Blood/the Martyr and the buff to haste in patch 3.1 the following comparison is outdated, and this axe will be better than the mentioned sword simply because of the dps difference. I will let this comment stay here for now for anyone who might still be interested in the old mechanics. Since there was some debate between the Colossal Skull-Clad Cleaver and Sword of Justice, I thought I'd take a moment to explain why someone would want the Sword of Justice over the Colossal Skull-Clad Cleaver since I, as a retribution paladin, use the sword instead of this axe. While this axe has 17.3 higher base dps, the sword is .4 speed slower (3.8 vs 3.4) and with our PvE dps seal Seal of Blood/Seal of the Martyr not being normalized, .1 weapon speed gives about 30 extra dps - roughly equal to 5.7 weapon dps. Thus .4 slower speed would equal 4 * 5.7 = 22.8 weapon dps, making the Sword of Justice equal to a 192 dps weapon at 3.4 speed - an advantage of 5.5 dps over this. The slight lack of strength on the sword is made up for by the red socket in which you can put a +16 str gem giving the axe only 4 more strength (equal to 10 AP with 5/5 Divine Strength and Blessing of Kings). While agility does scale with raid buffs like Blessing of Kings, crit rating gives more crit chance per itemization point meaning it is generally better than agility. Aside from that, the crit rating on the sword gives more crit chance than the agility on the axe, and the axe has a lot of "wasted" itemization points on haste rating which is a rather 'meh' stat for ret pallies; it's true that haste does give slightly higher white damage and more Blood/Martyr damage because of faster hits, but crit is far better as it also effects many of our other spells (especially Judgement of Blood/Martyr, which is a ret paladin's main source of damage on bosses). Overall, for a retribution paladin the two weapons are almost equal but I would still go for the sword because it seems slightly better if you factor in all of the details. I'm not saying this is a bad axe (since it isn't), just that it's not the only option for a retribution paladin gearing up for raids. Edit: As the post I was originally replying to has been deleted, I have reformatted this post slightly to be a more generic comparison between the two weapons. His comment of 'or only for ret pallies' was refering to it being their 'only' axe - asin they would only get one (as oppose to furys getting 2 for duelwielding). Please read what context the person your replying to was posting in. It isn't harsh to say a fury warrior aiming for his second axe should pass for a ret pally (or DK) whom can only get/need one. It's really quite amazing. You can almost sense the design process. Ok so I have a question for those of us ret pallys out there hit rating is a important factor to have where you need it to be and the cap is set right now at 297 last I checked My hit rating is at 220 in that case i have this weapon would it be better for me to use titansteel destroyer over this one due to the fact that it has the plus 54 hit rating and will put me much closer to the cap vs using the +16 yellow hit gems to bring it up. whats with the purging and all that? can anyone tell me, for a ret paladin, would this item be better or would the titan steel mace be better? Just a note for those people wondering about what enchants will show on this. The http://www.wowhead.com/?item=41976 effect will show up but curiously http://www.wowhead.com/?item=22559 will not, which was highly disappointing for me. As for the berserking and massacre enchants, I can't comment on those as I'm saving the mats for those enchants on Death's Bite/Betrayer of Humanity. The drop rate on this is very low. I've ran it for 2 months now and it dropped for the first time today, unlucky for me, someone ninja'd it. YO DAWG! WE HEARD YOU LIKE AXES. So, we put an Axe on your Axe on your Axe on your Mining pick, so you can cut while you cut! I was wondering, should i use this axe or Saliva Corroded Pike for DK tanking? This axe have more avoidance but the polearm have loads of stamina on it. Well did my first heroic HoL 2day on my DK and was and to my surprize and great pleasure this sweet lil axe droped. Damnit, beat me to it. Just got this baby on my pally. Yeah, it was freaking awesome. I annoyed the crap out of my guildies ( who took me on the run) by linking it a million times, but hey, it's bada$$. Yay Yay Yay Yay Yay! Does it seem like the axe have a higher drop rate than just 17%? Just kinda meaning does it seem like it drops more often than the percentage gestures? Then Saurfang decided he didn't need an uber axe to still be awesome, so he dropped it...Loken found it, and now he r Lolz! This is more of a polearm than an axe. The Titansteel Destroyer has the advantage of having far more strength and some hit rating. If you are not hit capped (8% or 262 rating), that would probably be the better choice, but considering how easy it is to reach the hit cap without a weapon with hit rating it should not be necessary. 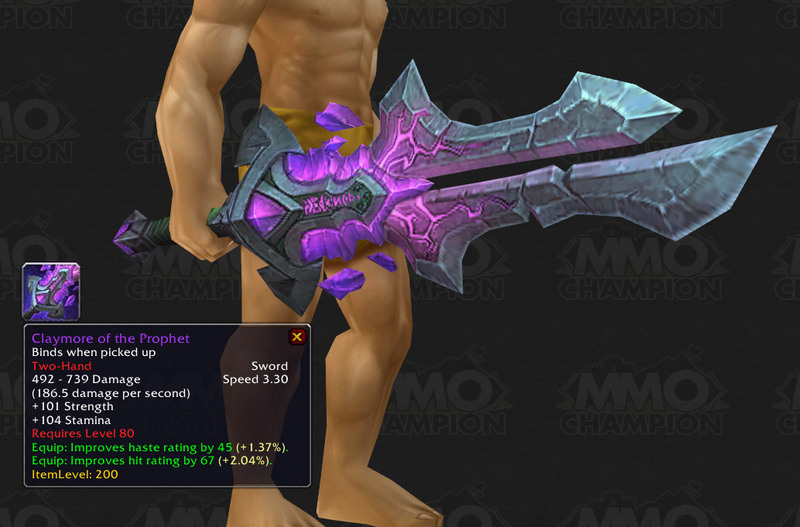 With the same speed as this axe, the main difference between those two boils down to 54 agility (just over 1% crit as a paladin) vs 34 strength (85 ap with 5/5 Divine Strength and Blessing of Kings). While Sword of Justice has much less strength, it does have a much slower speed and lots of crit. I would really consider these three weapons to be roughly equal and the better one would mainly be determined by your current gear situation. If you lack hit go for the Titansteel Destroyer (or regem for hit), and if you prefer more crit go for the Sword of Justice or the Colossal Skull-Clad Cleaver. Availability plays a large role in this as well. The axe drops from a heroic end boss who is usually considered to be a pain to do with a pug, and the mace is quite expensive to craft. To me that makes the sword more appealing, but I guess it comes down to personal opinions at that point - if you have enough money you could get the Titansteel Destroyer without ever setting foot in a heroic if that's what you want. TL;DR: They're all more or less equal with some advantages and disadvantages each, so go for whichever you want, really. I am still using the sword in heroic raids and it serves its purpose well, which the other two would most likely also do. How many times did you have to do this instance to get the item to drop? I've done it 7 times now and haven't seen it. ahh this axe looks awsome (stats and graphicz!) great for dk tanks (nice negation :O) and starting dps. what i dont like is that it drops from the last boss of a kinda long instance :P. bummer. I just finished run 16 without seeing this thing drop. My poor pally just got out-rolled on this by a hunter. On the bright side, at least that hunter will melt faces in melee, amirite? Edit: Downranked eh? Guess I made some poor huntards angry. Ok, ok, you win! This is totally a hunter weapon. A hunter that rolls on this weapon seriously needs to delete their toon... it's almost as bad as a hunter rolling on Gorehowl. Did six runs, got two axes (TG war). RNG! I CAN'T ESCAPE THE MEME! anyone else see the model similarity to http://www.wowhead.com/?item=38633# ? not so much the details, just the main shape of it. just thought i'd share. Tell me about it,,,,,,,,,I had to run this H Hol at least 20x to get it. At least! Tonight it paid off,,,,, Never give up on trying to get it guys and gals,,,,,you will eventually. Done HOL HC last night, group brought Loken down but then got wiped, i used Pally Cheat ^^ (LoH and Bubble) finished him off and group gave me the axe as a reward, so thanks to them I now have a good retri weapon. Great axe btw and looks awesome. Had been trying to get this one on my death knight for four days. Always some hunter/paladin rolling higher than me. After the fourth run I cried myself to sleep while creating the most diabolical plan ever. The next day I spent about one hour finding druids, AND ONLY DRUIDS, who wanted to run the instance. It dropped and I realized I should stop playing this time consuming game. tell your hunters that they are retarded. Got this on my 11th kill, been dropping every time since. It has the essential stats for all 3 melee 2h weapon wielding classes. So in short, the best weapon to have before going to raids. that slays me. so funny. Is this better or is Titansteel destroyer better for a DK? i really wanna see how fast this gets down rated. 90 str begs to differ with your statement. I wouldn't think this axe would be very good for tank or DPS Death Knight. Agility really has no for a DK use unless used for PvP. Even then, its debatable whether it is really that much more helpful. I would say to find something with better STR. Only ever ran HOL heroic 2 times, and got this on the second run through tonight. Used this to replace an Argent Skeleton Crusher, so hopefully with a nice enchant it will boost my DPS as Fury Warrior (yes I'm still Fury despite the crappy TG nerf). wow.. it makes me sad knowing i said that this wep was good for dk tanks (cus of the negation) and got downraited.. and other people said the exact same thing and got +23 for it "cough exShinra"
I have a question if i may ask, what is better this with titensteel destroyer or 2 of this? sorry if this question bothers you. Think its good enough for hunters? The thing that makes me wanna pick this up over Titansteel Destroyer is the fact that my DK is an orc and benifits from http://www.wowhead.com/?spell=20574, and expertise is a stat all tanks want. So keep it in mind if you're an orc. Just thought i'd add my 2c as an arms warr. In the arms tree you have to spec depending on your weapon into Poleaxe spec, Mace spec or Sword spec. I have heard from various sources that sword spec is the worst of the three so a mace like the titansteel destroyer or an axe like this one might be more useful to you than a sword such as the Claymore of ancient power. There were hunters in TBC who used Gorehowl with Monoose. Hoorah for huntards! That holy paladin/prot warrior/whatever really didn't need it as much as you did! Hay gais i'm not sure if this is obvious but this isn't a hunter weapon..
You're right, they didn't. Holy paladins should be HEALING, thus there is no need AT ALL for a DPS weapon, and the prot warrior should be tanking with a one-hander and a shield. I were so lucky that the Cleaver dropped on my first time doing HoL hero.. Or it was second time, but the first time, my party didnt manage to kill Loken.. So were a little lucky that I won it when 2 DK's rolled need for it :) I'm a retradin btw. This is the best arms warrior weapon available in the game pre-raiding. Arf.... Just dinged 80 with my DK, went on AH, bought a Titansteel Destroyer and happily went on my first daily heroic, only to have this drop and noone else needing it.. That was 1,2K gold well spent! maybe im blind but no one has commented on these being non-unique and that a fury warr could have TWO cleaver clad skulls! thats like what? 8 blades and two scythes? I had only run hol twice, i do fairly well as a dk tank when i had really crappy 78 green weapons, i'm looking forward to seeing how much better i do with this one. Is this any good for a human dps blood dk? Skull clad normally suggests multiple skulls. I only see one The proper name would be "Colossal Axe-clad Axe" or perhaps "Colossal Axe-Clad Object" or my personal favorite "Colossal Blade-clad Pointy Stick"
In 4.0(/3.9), will the agility on an axe like this (Warrior/DK/Pally weapon) be converted to crit rating? 7 Loken kills here and still no sign of this thing. My bad luck run with weapons seems to have no end. oh and Yxor = axes in swedish. A favorite 2h Axe Model, I used this through alot of Raid Content in Wrath, and held on to it for sentiment. Now, with Transmog, I look forward to putting its skin back into play. Equip a Gordok Ogre Suit and this already huge 2H axe scales to about the size of your average murloc hut.